The three words in this headline are loaded with meaning, all of it directly connected to our founder, Louis Sudler. He built this firm on the promise of delivering first-rate service to his clients. 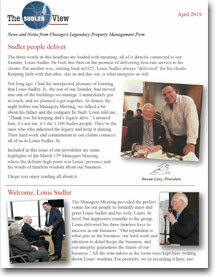 Put another way, starting back in1927, Louis Sudler always “delivered” for his clients. Keeping faith with that ethic, day in and day out, is what energizes us still. Sharp-eyed readers will have noticed the word “legendary” in our masthead. We admit it’s a bit of a boast, but we’re also convinced it’s an accurate descriptor for Sudler Property Management. No other company in this business has anything close to our storied 90-year history. It all played out right here in Chicago and originated with a true giant. 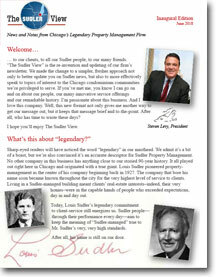 Louis Sudler pioneered property management as the center of his company beginning back in 1927. 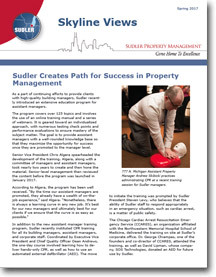 As a part of continuing efforts to provide clients with high-quality building managers, Sudler recently introduced an extensive education program for assistant managers. 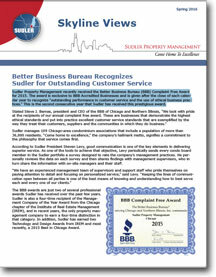 Sudler Property Management recently received the Better Business Bureau (BBB) Complaint Free Award for 2015. The award is exclusive to BBB Accredited Businesses and is given after the close of each calendar year to recognize “outstanding performance in customer service and the use of ethical business practices.” This is the second consecutive year that Sudler has received this prestigious award. 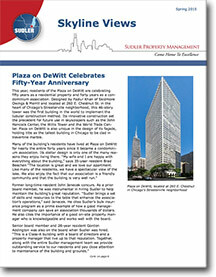 This year, residents of the Plaza on DeWitt are celebrating fifty years as a residential property and forty years as a con-dominium association. Designed by Fazlur Khan of Skidmore Owings & Merrill and located at 260 E. Chestnut St. in the heart of Chicago’s Streeterville neighborhood, this 46-story tower was the first building in the world to implement the tubular construction method. 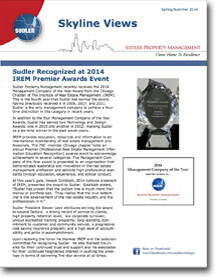 Sudler Property Management recently received the 2014 Management Company of the Year Award from the Chicago Chapter of The Institute of Real Estate Management (IREM). This is the fourth year that Sudler has earned the award, having previously received it in 2006, 2007, and 2011. Sudler is the only management company to achieve a four-time distinction in this category in recent years. As an added benefit to clients, Sudler recently introduced eTrak, an electronic package tracking system for exclusive use at Sudler-managed properties. Created by Gordon Weis, the Web designer who developed Sudler@Home, eTrak is a Web-based system that notifies residents about package arrival. Its electronic features allow for increased efficiency in use of time and labor, more timely communication with residents, and improved capability for collecting data related to package pickup and delivery.